2016 will be remembered as a year of surprising results at the polls, both here in the UK and over in the US. It was with some prescience that the Swiss philosopher Henri-Frédéric Amiel wrote in the mid-19th century “The age of great men is ending; the epoch of the anthill, of life in multiplicity, is beginning”. These words predated the global population explosion of the 20th century, and they now appear to predict the distinct lack of greatness in global leadership in the early part of this 21st century. A lack of strong, consistent leadership of our nations – as well as of our cities – is no doubt one of the reasons for the inertia in facing up to the twin challenges of resource depletion and climate change. At times, it can be hard to see anything other than a dystopian future ahead of us. One that has us scrambling for ownership of increasingly scarce resources – energy, water and materials – in cities that are choking on emissions and baking under the heat-island effect. The more utopian view is a future in which the big energy and transport problems have been solved by technology. In this world, the circular systems that manage water and rainwater ensure that no citizen goes thirsty and promise a healthy and pleasant life for all. Grand plans usually require great people to inspire and deliver. Amiel may have been right, in that we can no longer rely on centralised governments to provide the leadership required to achieve this utopian vision. Adding to the challenge, intensification of the city is occurring all over the world. For the most part, developments tend to be piecemeal and there are relatively few places where joined-up thinking about structure and infrastructure with planned urbanisation is more than half-hearted. It therefore mostly falls to the leadership and inspiration of individual clients and project teams to evolve and deliver better projects and places. Since setting out on our journey as Atelier Ten more than 26 years ago we have tried to do our bit to foster and inspire the step-change in the approach to low carbon and sustainable design that is so urgently needed. In practice, I believe the future will sit somewhere between the dystopian and utopian extremes through a continuation of the incremental improvements of the past 35 years, rather than by conforming to some grand plan or design. In the age of Amiel’s anthills in multiplicity, we will continue to work with our collaborators and colleagues to define the frontiers of sustainability, healthy buildings, and environmental design, providing leadership in industry. 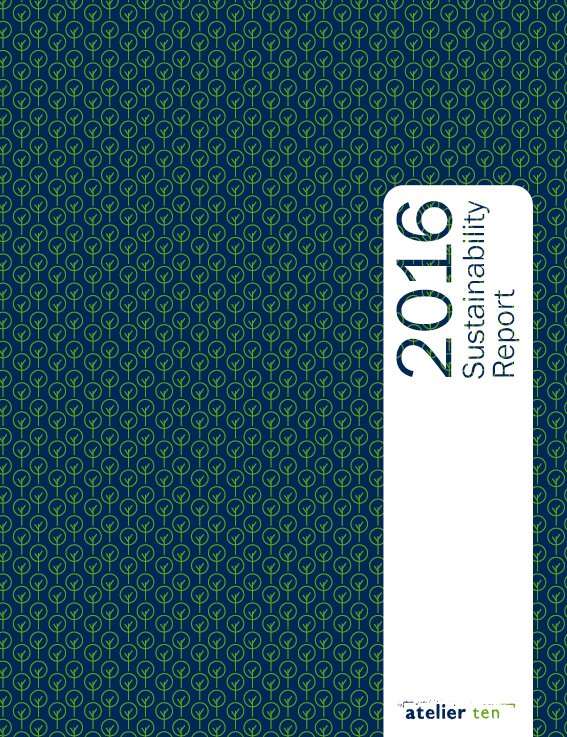 This report summarises the efforts we make internally and externally to reduce the impact on the environment of not only projects we are engaged on, but also our physical operations. Three of our offices relocated or were refurbished this year – all making a commitment to lower energy use in operation and to the health and well-being of our staff. This report illustrates our continued commitment to the issues at hand, starting at home.